LOWER TONG'S & HIGHER TONG'S FARMS. This ancient farm is reached by walking up the steep incline of Longshaw Ford Road from Barrow Bridge until one reaches an unmade land crossing the road. To the right of the track leads to Pendlebury's Farm whilst that to the left leads to Lower Tong's. The entrance to the farm is on the left and just beyond the the lane takes a sharp turn to the right, going on to Higher Tong's and Collers' Row Road. The property is no longer farmed but is the residence of Mr & Mrs Nick Gordon who have turned it into a delightful home without spoiling its rural and historic aspect. The farm goes back many years as is apparent when one views the masonry with its mullioned windows and splitstone roofs. The earliest written record we have of the place is to be found in the Gerrard Manuscripts in the Reference Library. These are a collection of extracts of indentures and deeds connected with Smithhills Hall Estates that were gathered and transcribed by a Mr Joseph Gerrard in the 19th century. They are valuable source of information for researchers into the history of properties on Smithills Hall lands. The reference to the farm which later became known as Lower Tong's is found in an extract of a copy of a lease and memorandum of the 14th July, 1713. This indenture was made between Thomas Bellasys, Viscount Fauconberg of Smithills and two yeomen, Ralph Fogg of Blackrod and James Smith of Newton to whom Lord Fauconberg "doth Farm Lett all that parcel of Lower Dean next adjoining Langshaw Ford Bridge containing 36 acres (These would have been Cheshire Measure) and a quarter part of the moor know by the name Higher or Great Dean in the Parish of Deane and late in the possession of James Pendlebury". The word "Dean" is an Old English word synonymous with 'river valley' and the valley concerned is that of Dean Brook. Langshaw Ford bridge is the predecessor of the one which stands today just before one reaches 63 Steps. The 'Higher or Great Dean' lies to the left of the bridge and on large scale O.S. 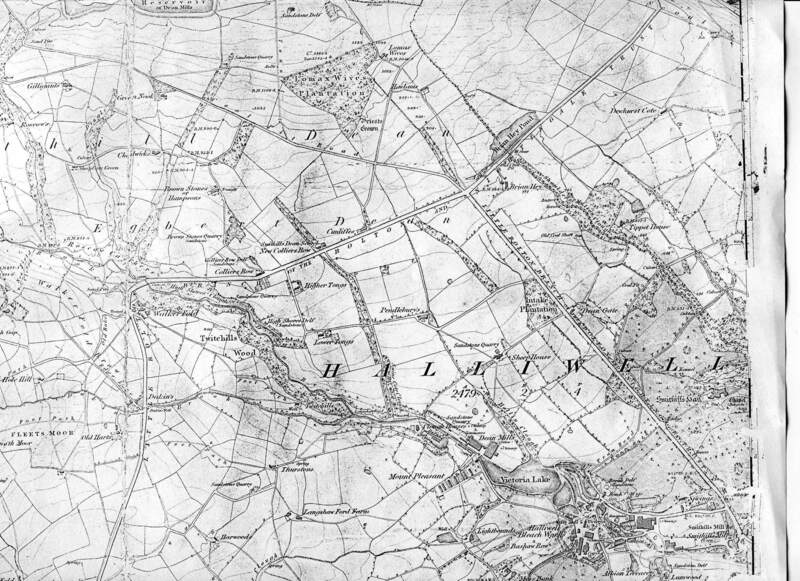 maps is named High Shores Clough and Lower Tong's lies overlooking the clough. In 1713 the land here would have been an expanse of moorland for Colliers Row Road would not have existed. Tenants will show the premises and further particulars may be obtained by applying to Mr Barlow of Little Bolton in the said County, Yeoman, and Mr Smithson, Attorney at law of Bolton aforesaid". Without a doubt this is Chaddock's but from where did James Booth come and what happened to James Smith? Miss Byrom was the heiress of Edward Byrom of Smithills who preferred to live in her Manchester home at Kersall than the great hall at Smithills. It was she who sold the estate to Peter & Richard Ainsworth in 1801. There must have been some building there before the days of Fogg and Smith for we see in another useful document, the "Poor Rate Returns of Halliwell 1798-1811", that in 1798, one Ralph Tong, the eventual name father of Tong's Farm, was occupying a piece of land called "Chaddocks" and valued at £16 p.a. He was the successor to Fogg and Smith. The reference in the indenture to James Pendlebury also points to the old name of Lower Tong's being Chaddock's because this James Pendlebury's family gave the name to Pendlebury's Farm and he had previously farmed Chaddock's. The Poor Rate Returns for 1801 reveal that Ralph Tong is still at Chaddock's but those for 1802 call the place "Tong's". We know it is the same place name for the valuation remains the same and Chaddock's is no longer mentioned as a separate property. 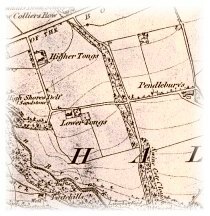 It was probably the Ainsworths who built the second farmhouse nearer to the Turnpike road (Colliers' Row Road) after this highway was constructed in the early 19th century and this farm became known as Higher Tong's. Deane Parish registers inform us that Ralph Tong was buried at Deane in 1804 and Richard Ainsworth, who now possessed Smithills Estate, divided the land into two tenements - one based on Higher Tong's and the other at Lower Tong's. The tenancy of Higher Tong's he seemed to have kept in his own hands as it is shown in his name in the returns for 1806 valued at £8 p.a.. However, the older Lower Tong's, which is listed as also having a loom-shop, is valued at £9 p.a. and is tenanted by Henry Rushton. Looking now to the Smithills Estate Rentals for 1814 we find the Lower Tong's reverting to the name of "Fogg's" and still being tenanted by "Widow Rushton" at a rent of £44 p.a. 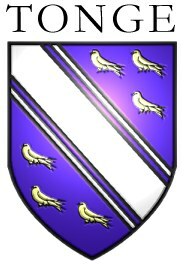 The Higher farm being now in the possession of Henry & Major Norris as tenants. Widow Betty Rushton is still in possession in 1819 paying an increased rent of £53 p.a. whilst the Norrises are assessed at £60 p.a. although shortly afterwards they moved to Bryan Hey Farm. By 1869 both farms are referred to as Tong's (Higher) and (Lower) with Thomas Cooper farming Higher and James Sewart the Lower. Sewart's are still living in Barrow Bridge and the family now have nursery gardens in the village. They are, in fact, the earliest recorded family still living in Barrow Bridge. By 1890 the Post Office Directory tells us that Higher Tong's was farmed by James Brown and Lower Tong's by John Holden. These two farmers had both either left or died by 1902 for in that year the Royal Lancashire Show was held at Preston and Colonel Richard Ainsworth of Smithills sent postal orders for 22s 0d to all his tenants via his steward, Roger Walsh, to enable them to attend the show. The tenants are listed on a paper to be found in the Ainsworth Papers in the Reference Library and from it we find that Mrs Lonsdale was at Higher Tong's and James Taylor was farming Lower Tong's. By 1927 Tillotson's Directory shows us that Thomas L. Naylor was carrying on dairy farming at Lower Tong's and Henry Winstanley was in the same business at Higher Tong's and both farmers were still going strong in 1932 according to the directory for that year. Today Higher Tong's is still a dairy farm with a high class herd of Jerseys run, until recently, by the late Mr McGuiness but the other farm ceased dairy farming some years ago and for a time was active as a poultry farm. However, even this ceased some time ago and the old buildings became the home of Mr & Mrs Gordon and their family.